Philadelphia, Wayne,PA and Main Line Periodontist, Dr. James Vito, is a specialist trained in the diagnosis, treatment and management of gum disease and bone loss – also known as gingivitis and periodontal disease. Dr. Vito received his specialty training at the University of Pennsylvania School of Dental medicine in the prestigious Periodontal Prosthesis Program where he received dual certification in Periodontics and Fixed Prosthodontics. One of few dual trained specialists in the world. 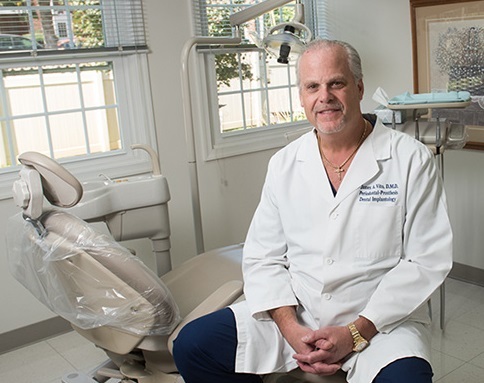 Dr. Vito is consistently recognized as one of the best dentists and dental implant specialists of the Main Line since coming to the area in 1999. As a well-versed dentist Dr. Vito addresses the importance of educating his patients on the symptoms and progression of periodontal disease. This enables his patients to take preventative measures and recognize when professional gum disease gingivitis treatment may be necessary. For your comfort and convenience, sedation services are offered in Dr. Vito’s office. -Experiencing swollen gums or a possible infection? What is the root of most dental problems? The root of most dental problems is plaque. Plaque is a combination of food, bacteria and dead skin that lines the mouth. This combination forms an acidic, slimy film that readily adheres to the teeth. This plaque then hardens over time to form a barnacle like substance called calculus (tartar). This acidic film results in two destructive dental processes: Dental Decay, followed by Periodontal Disease. Plaque is a destructive bacterial process that etches the enamel or root surface creating weak points in the enamel or root that ultimately undermines and weakens the tooth structure to the point that this acidic film works its way into the tooth resulting in dental decay that destroys tooth structure. 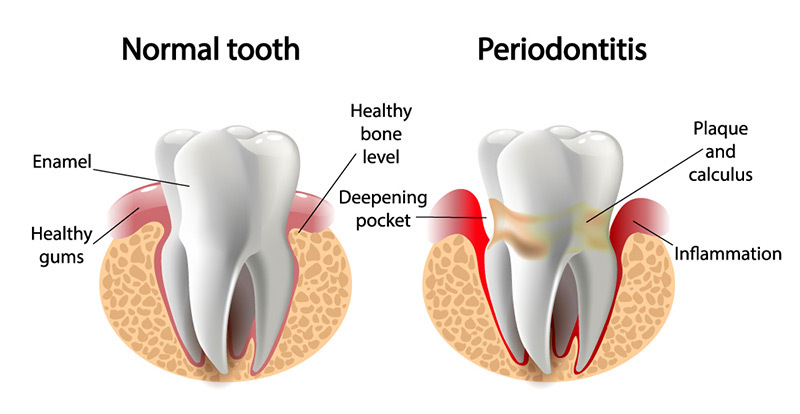 Periodontal disease is a destructive inflammatory progressive disease that begins initially in the gums (gingivitis) and progresses to the surrounding bone, often resulting in irreversible bone loss. This inflammatory process can only be resolved by the removal of the plaque, corrective periodontal surgery and/or bone regenerative techniques. Regular hygiene maintenance appointments are key to maintaining periodontal health and minimizing additional problems, which may necessitate further periodontics treatment. Recently, periodontal disease and the bacteria associated with it has been linked to an increased likelihood of heart attacks in people with a history of heart disease, complications with pregnancy resulting in premature low birth weight infants, increased periodontal problems in the elderly who live in a community setting and increased infection complications with patients who are either diabetic or undergoing cancer therapy. With these consequences, the field of periodontics can help you maintain not only the health of your teeth, but also your overall health. As a multi-specialty dental office, our job, in addition to treating dental disease, is to educate our patients about gum disease and stress the importance of the complex interaction between the host (patient) and the pathogenic bacteria that resides in the mouth. It is important to resolve the problem early and make sure periodontal patients understand the importance of keeping their regularly scheduled hygiene maintenance appointments determined by their specific needs. This is key to preventing and/or minimizing future problems of either a restorative or a periodontal nature. A periodontal condition characterized by irritation of the surrounding gum tissue and swollen bleeding gums. There is no bone loss associated with this process. A periodontal condition similar to gingivitis but with radiographic evidence of bone loss, up to 10% of the total volume of bone. Gingivitis with radiographic evidence of bone loss, up to 50% of the total volume of bone. Additional symptoms include tooth mobility, shifting of teeth, halitosis, metallic taste and spontaneous bleeding of the gums upon probing. A periodontal condition of severe gingivitis with radiographic evidence of bone loss greater than 50% of the total volume of bone. This stage is marked by extremely visible mobile teeth, shifting, and spacing of teeth under normal function, persistent halitosis and metallic taste. Tooth loss is probable and will require extensive corrective work to repair. Learn more about Gum Disease and how to treat it. Treatment involves a professional cleaning along with persistent self oral care. It’s important to floss and use mouthwash daily, along with brushing at least two times a day. Have you had your oral health evaluated? There is no cure for periodontal disease or dental decay. However, the appropriate periodontal treatment can control and limit the progression of both these disease processes by minimizing the bacterial buildup in one’s mouth. The bacteria responsible for dental decay and periodontal disease inhabit the mouth 24 hours a day. Only through the proper diagnosis and treatment of the specific periodontal problem and adherence to a strict hygiene maintenance schedule based on one’s disease activity can minimize the severity of periodontal disease or tooth decay. There must be a partnership between our office and our periodontal patients. Dr. Vito and his staff will help educate and treat you, but the patient must understand their dental condition, be an active and cooperative participant in their treatment and exhibit good oral hygiene on a daily basis. Through this partnership a patient can expect to have not only a smile that is healthy, functional and aesthetic, but also one that should last a lifetime! Soft tissue grafts are sometimes performed to treat gum disease or correct other soft tissue abnormalities. Periodontal procedures are available to stop further dental problems and gum recession and to improve the aesthetics of your gum line. For example, an exposed tooth root resulting from gum recession may not be causing you pain or sensitivity, but is causing one or more of your teeth to look longer than the others. In other cases, an exposed tooth root causes severe pain because it is exposed to extremes in temperatures or different kinds of food and liquids. Once contributing factors are controlled, a soft tissue graft procedure will repair the defect and help to prevent additional recession and bone loss in teeth. 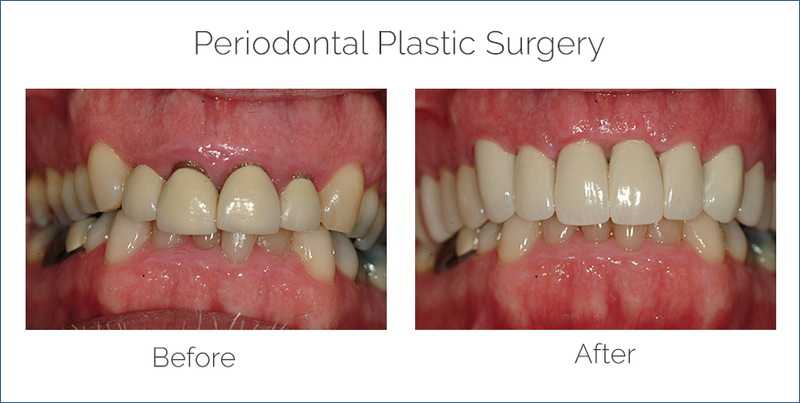 The art and science of aesthetic periodontal surgical techniques can be performed to enhance and improve not only gingival health, but also the aesthetics of your smile. By performing simple surgical procedures, many with the dental laser, results can be achieved and maximized that may not be attained through restorative dentistry alone. The art and science of aesthetic dentistry is to create a picture utilizing the color, shape, position, symmetry and luminescence of the teeth, which is then framed by healthy gum tissue to achieve a smile that is healthy, youthful and natural. For more information, contact Dr. Vito’s periodontics practice in Wayne. The procedure begins with administration of a local anesthetic to reduce any discomfort. Then, a small instrument called a “scaler,” or an ultrasonic cleaner, is used to clean beneath your gum line to remove plaque and tartar. The root surfaces on the tooth are then planed and smoothed. Scaling and root planing helps the gums reattach themselves to the tooth structure. Additional measures may be needed if the periodontal pockets persist after scaling and root planing. The objective with scaling and root planing is to remove dental plaque and calculus (tartar), which house bacteria that release toxins which cause inflammation to the gum tissue and surrounding bone. This is a non-surgical procedure done to treat periodontal disease and gingivitis. For more information on our periodontal practice, serving the Philadelphia, PA and Main Line area, contact our Wayne, Pennsylvania office (610) 971-2590.